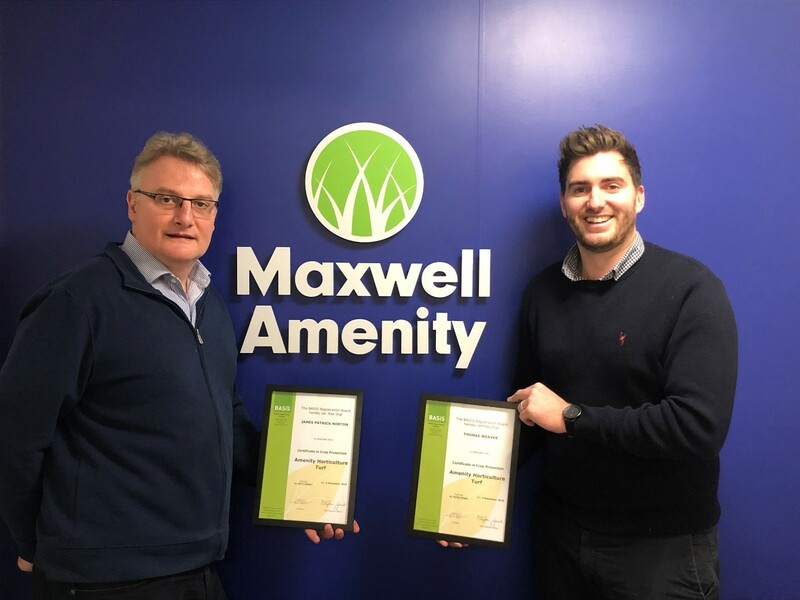 Maxwell Amenity have furthered their commitment to providing customers with agronomic advice of the highest quality by supporting two members of the technical sales team through their BASIS Amenity Horticulture Turf qualifications. Technical Sales Advisor, James Norton (left) and Sales Manager, Tom Weaver have both passed their BASIS certificate in Amenity Horticulture Turf courses carried out at the STRI HQ in Bingley. They will continue with CPD to remain on the professional advisors register. BASIS is an industry recognised, independent standards setting and auditing organisation who offer a range of exams for industry professionals. With ever changing legislation affecting products widely used within the amenity and horticulture industry it is vital for sales advisors and agronomists to have the knowledge and expertise to advise customers on methods of best practice. Tom, who also has a BSc in Sports Turf Management, commented that "I feel that the course has allowed me to develop my knowledge and will help me to provide customers with high quality and effective solutions to their turf problems". James, who has previous experience as in both greenkeeping and groundsmanship, acknowledged that the course has furthered his knowledge of industry products including fungicides, herbicides and insecticides and he commented that "I now feel that I'm much better positioned to advise customers on a range of products from both a practical and legal perspective". Dan Hughes, Sales and Marketing Director, outlined that "We are committed to developing our staff and ensuring that our customers are receiving accurate technical advice and follow latest industry best practice. Working with rapidly changing legislative, technology and climatic conditions, it is important that we continue to develop and support our staff through accredited industry qualifications. As anyone who has undertaken BASIS will testify, it is a tough qualification that requires extensive study and expertise. We are immensely proud of both individuals and our team now extends to ten qualified BASIS advisors and two BASIS trained storekeepers."